Taoiseach Leo Varadkar’s partner Matt Barrett has accompanied him to breakfast with US Vice-President Mike Pence this morning. Later, Mr Varadkar will have talks in the Oval Office with president Donald Trump on Brexit and undocumented Irish immigrants. The day started with the breakfast meeting with Mr Pence in his residence at the US Naval Observatory. In the presence of the Christian conservative US Vice-President Mike Pence Mr Varadkar said he once lived in a country where if he had been himself he would have been breaking laws. He said: “I stand here this morning as leader of my country, flawed and human, but judged by my political actions and not by my sexual orientation or my skin tone or my gender or religious beliefs. “And I don’t believe my country is the only one in the world where this story is possible. “It is found in every country where freedom and liberty are cherished. “We are after all, all god’s children. Mr Varadkar said Ireland is not the only country where his story was possible and it’s true of the US as well. 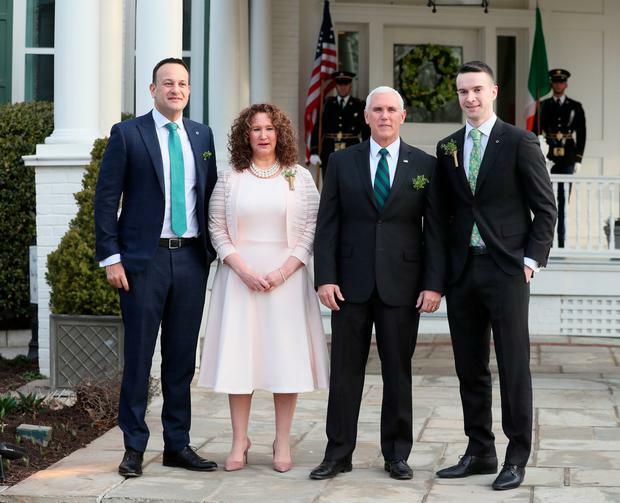 Mr Varadkar who, along with his partner Matt Barrett, attended a breakfast at Mr Pence’s Washington home, thanked the Vice-President for his “wonderful hospitality”. Mr Pence said Mr Varadkar had offered “Inspiring words”. But last year he and his wife extended an invitation for both the Taoiseach and Mr Barrett to visit his Washington home. Mr Varadkar is one of very few openly gay world leaders. Mr Barrett is a cardiologist who has spent time working in the United States. Mr Pence opened his speech at the Washington Naval Observatory saying “Top of the morning and welcome to the official residence of the Vice President”. He said President Donald Trump is looking forward to meeting Mr Varadkar at the White House later. Mr Pence said that the United States stand with Ireland during Brexit. He thanked Mr Varadkar for an invitation to visit Ireland and Mr Pence, an Irish American, said he is making plans to travel to Ireland with his mother. There was controversy last year when the event was closed to the media. Mr Varadkar said he and Mr Barrett were “honored” to attend the breakfast. Earlier Mr Pence welcomed Mr Barrett referring to his time working as a doctor in Chicago saying: “Chicago’s home for you”. Mr Pence added: “all my family are from Chicago”. The Taoiseach will travel to the midwestern city tomorrow. Mr Pence spoke of the economic ties between the US and Ireland highlighting trade of almost $130bn a year. He added: “Thank you also for the invitation to make an official visit to Ireland. Mr Varadkar said he hopes Mr Pence and his mother Nancy would be able to visit very Ireland very soon. He said a “very warm welcome awaited Mr Pence in Clare and Sligo where his forebearers come from. Mr Pence was accompanied by his sister Anne Poynter. His wife Karen is in Abu Dhabi to attend the Special Olympics. Dr Barrett will not be part of the traditional shamrock ceremony in the White House. Mr Varadkar discussed equality and LGBT rights in Ireland and America with him last year. Asked about his talks with Mr Trump, the Taoiseach said: “We’re not asking anyone here in America to take sides between the UK and the European Union and Ireland. We know they will want to negotiate a free trade agreement with the UK into the future. Mr Varadkar added that it would be “very welcome” if Mr Trump is open to appointing a special envoy to Northern Ireland. 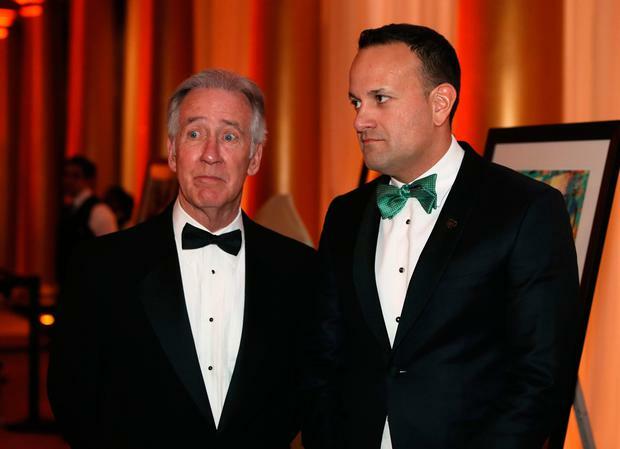 On his first day in Washington, the Taoiseach had meetings with US and Irish business figures and attended the American- Ireland Fund dinner.